Glorious sunshine greeted players and spectators to Grange BC for the Warwickshire County Bowls Association Finals Day. The players ensured that the crowd was well entertained and witnessed another piece of history being made. Six times Single Champion and current holder Graham Ashby (Avenue Coventry) was again in the Singles final, looking to become the first player to win three title in a row. In his way the current Junior Singles Champion Craig Carter (Rugby). With the scores on four all Ashby reeled off five singles and a double to open up an 11-4 advantage, the players traded blows leaving Ashby 14-9 clear before he scored a treble and brace of doubles to take seventh title and register a hat trick of victories, final score 21-9. The County Two Woods final saw Matt Wordingham (Avenue Leamington) take on Adam Shuttleworth (Whitnash). There was little to separate both players early on, one would score and the other would cancel them out. With 13 ends played the score was level on nine all, Wordingham hit a couple of singles and Shuttleworth responded with one of his own. A single and double saw the man from Avenue four clear, Shuttleworth replied with a double but a twentieth end single saw Wordingham take the title 15-12. Erdington Court’s Rob Robinson and Richard Brittan found themselves seven shots adrift of Brian Lees and Martin Timms (Welford) after five ends. With ten ends played the Welford pair led 10-6, they then hit a double and single but the Erdington pair replied in kind. With two ends to Erdington Court had cut the deficit to just a single shot and then took the lead for the first time in the game with a four. 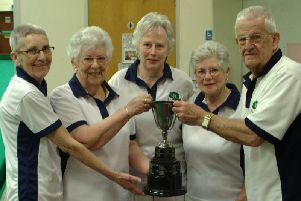 Lees and Timms steadied themselves and secured the Pairs crown with a four of their own giving them the 20-19 win. With five ends played the score was 5-5 between David Green, Will Pratt and Phil Green (Norgren) and Mark Ireland, Rob Robinson and Richard Brittan (Erdington Court) in the County Triples final. Norgren pulled away to an 11-8 lead but Erdington scored a four to retake the lead, which they built on to lead 17-14 with fifteen ends gone. Another four from the Erdington trio all but halted any remaining comeback hopes, the side from Birmingham taking the title 22-14. The Fours Final saw Adam Smith, Mark Smith, Matt Wordingham and Andy Smith (Avenue Leamington) take on Dave Mobbs, Bruce Trueman, Craig Carter and Tom Millership (Rugby). A steady start saw Rugby reach five ends 5-0 up, Avenue kick-started their effort and took a one shot advantage after nine ends. With fourteen ends played Avenue still held that slender advantage but a double, five and double followed by three singles by Rugby saw them take the Fours title, 21-10 the final score. The Mixed Pairs final saw Avenue Leamington’s Rhiannon Weale and Matt Wordingham and Brenda Carlton and Simon Rogers (Three Spires) locked on three all after six ends. The Avenue pair hit a quick fire nine shots to lead 12-3 at the midway point. Carlton and Rogers responded in kind, eight shots in four ends to cut the lead to one. Heading into the final end the lead was now three and Weale and Wordingham added a single to secure the title with a 18-14 victory. Richard Pope (Bilton) and David Blackmore (Stratford) met in the final of the Unbadged Singles. In a very one sided contest Pope raced away to a 10-2 lead, that soon became 15-5. A brace of singles, a treble and double was enough to take Pope over the finish line to claim his County Badge. The Ivens Cup semi final draw matched Rugby “A” against Wolvey “B” and Sherwood Park “B” against Norgren “B”. Sherwood charged ahead to a 17-2 lead after ten ends. Norgren mounted a brief rally, pulling the score back to 18-10 but Sherwood Park completed a 24-12 win to book their place in the final. Wolvey made the early running in the other semi final, 12-4 up after eight ends. Rugby hit back with a treble and four, cutting the deficit to just one but Wolvey again took control and made their way to the final with a 25-16 win. The Ivens Cup third/fourth place play off between Norgren “B” and Rugby “A” was looking to be a very tight affair until a five and three helped Rugby take a ten shot lead after nine ends. The sides cancelled themselves out for the remainder of the game, rugby taking third place with a 23-13 win. In the final itself Sherwood Park “B” built an early 5-2 lead but Wolvey “B” scored 13 shots to reach midway 15-5 ahead. The second half of the game was very even, allowing Wolvey “B” to win the Ivens Cup with a 20-10 scoreline.